Robert Freitas inspired this unique animation showing a crhomallocyte accomplishing its one and only mission: repairing cells. EXCLUSIVE product. Chromallocyte Reparing Cell 3D Animation is only available from CG4TV.com. We don't have resellers or representatives. This product that can not be purchased elsewhere. Nanobot Reparing Cell Damage. Robert Freitas inspired this unique animation showing a crhomallocyte accomplishing its one and only mission: repairing cells. Follow our tiny nanorobot as it enters the skin to undo, at microscopic scale, the effects of aging. Medical nanotechnology is the science of the future. Someday we will be able to dispatch these tiny healers to any spot in the body, to make repairs at the cellular level. We'll conquer aging and disease. This application of nanotechnology is just around the corner. Look for it soon! Let your imagine run wild as you think of ways to use this spectacular image of a nanobot repairing a cell! Evoke predictions of days to come! Excite imagination! 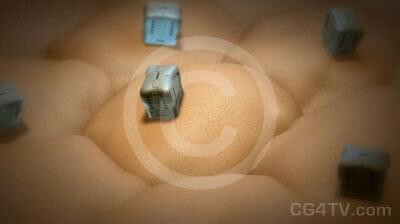 Our animation of a nanobot repairing a cell evokes employs the latest in photo realistic, high resolution 3D animation. And don’t forget, all our animations, including this one, are available in a variety of sizes and resolutions to meet your needs. Why spend money and time for custom work? Royalty free use of this low cost, stock animation of a nanobot repairing a cell will be easy on your wallet and on your busy schedule. You won’t find another animation of a nanobot repairing a cell anywhere on the market. Don't delay! Get our animation of a nanobot repairing a cell now. It’s easy. Just a few simple clicks of your mouse and you’re ready to go. Download is immediate. All major credit cards are accepted.